MODEL HOME LOADED WITH UPGRADES! 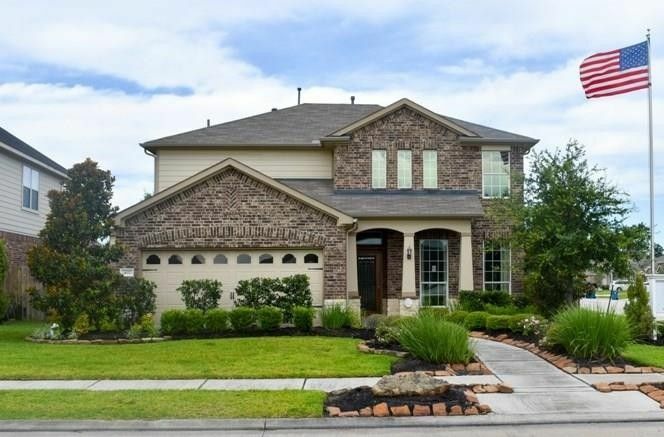 2 Story, 4 Bedroom, 2 1/2 Bath, Formal Dining, Tech Center, Fireplace, Game Room + Bonus Room Up, Master Bedroom Down, Dual Vanities with Separate Garden Tub and Shower, Wood Floors in Dining Room, Ceramic Tile in All Wet Areas, Granite Kitchen Countertops, Upgraded Stainless Steel Appliances, Side by Side Refrigerator, 42" Upper Kitchen Cabinets, Custom Tile Backsplash in Kitchen and Master Bath, Accent Paints Throughout, Upgraded Lighting and Trim Packages with Crown Moulding, Open Staircase with Wrought Iron Spindles, Stone Accented Elevation, Extended Covered Patio, Upgraded Landscape Package, Sod in Large Back Yard, Irrigation System, Full Gutters, Environments for Living Home, plus more... Available for Move In June 2019. Directions: From 1-45 North, travel West on S. Loop 336 (Exit 84) for 1.5 miles to Sgt. Ed Holcomb Drive, take a left, and the community is immediately on your right. Model located at 402 Oak Stream Dr.